Education is not about what I’ve taught; it’s about what students have learned. How can I find out what they’ve learned? Not on the day of the big test, but now. I need to find out so I can know what I need to teach, and students need to find out so they can know what they need to learn—today and tomorrow and each day before the big test. So that when we all come to that big test, there are no surprises for any of us. Annotating a text (marking it up, putting on paper what your brain is doing as you read) is something I have students do frequently. I use it to get them to engage with the text, to get them to hold their thinking for discussion, and to hold them accountable for doing the reading, thinking, and discussion preparation. So I give them credit for completion and I eavesdrop on their discussions. But I rarely read and give feedback on the annotations themselves, so while it’s a good instructional strategy, it’s not formative assessment. Cris Tovani in So What Do They Really Know? Assessment That Informs Teaching and Learning, which I read over Christmas break, would say my students and I are missing out. So this week I’ve started an experiment. 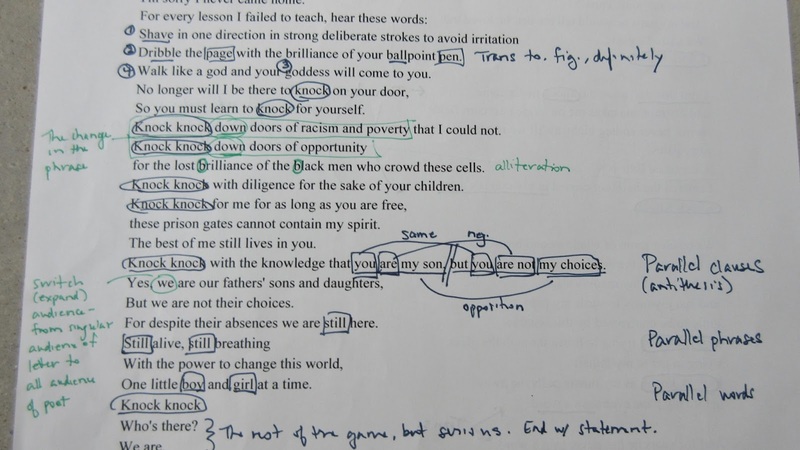 One of my assessments for the poetry unit will require students to annotate a poem they haven’t read before. 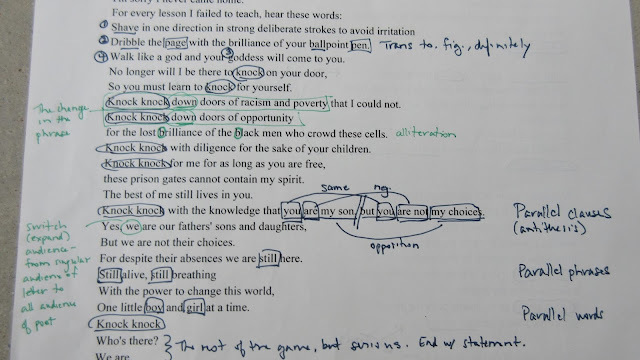 The first day of the unit, they annotated a copy of the poem “Knock Knock” by Daniel Beatty. (They got a little help by watching his performance on YouTube.) I collected and read them, looking for some text highlighted or underlined and some comments made about the marked text. I jotted a few comments and assigned points out of 5. Those who did not get the full points had either highlighted text without articulating why, or written comments without connecting them to specific words or phrases, and I encouraged them to add whatever they were missing and turn it in again for full points. I showed them my annotations (see photo) and told them that by the end of the unit, I expected theirs to look more like mine as far as the amount of ink on the page showing thinking, and to use the literary terms we would be discussing (assonance, consonance, alliteration, metaphor, simile, personification, symbol, etc.). 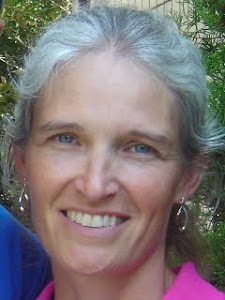 In class the next day, I could also acknowledge insightful comments they’d made (“J. noted that it’s not until the very end that the usual ‘punch line’ is given, and by then the question has been transformed from an innocent childhood game or a simple joke to a very serious matter”), and even comments that had deepened my insight (“When S. wrote by stanza 2, ‘Prison?’, I realized that Beatty composed this poem to put the reader in the little boy’s shoes—we have a clue, but we are also feeling as confused as he is”). Next Friday will be the summative assessment for poetry annotation. I’ll be interested to see how this all works. Though it will also be formative in that the next step, after getting all the meaning they can out of a poem, will be organizing that meaning into an essay when they write a poetic analysis of an individually selected song lyric…. Every day is an adventure when figuring out what these students, today, in this class, know; what they need to learn; and how I can help them. How do you find out what students know, what they need to learn, and how you can help them?